If you have wine or liquor to move to your new home, it's a good idea to ensure the bottles are properly packed so that you don't lose any of your stock. Bottles can break easily if they are not packed well, and broken bottles means a real mess, not to mention a loss of potentially valuable (or at least coveted) libations. Packing bottles for shipping takes the most care, of course, but even short moves call for careful planning to prevent damage. Check your inventory of bottles and determine what you really want to keep before you start packing. Liquor and wine bottles are heavy, and if you're paying per pound to move them, consider what is worth moving and what isn't. If you're moving a long distance and don't want to pay to move all your bottles, consider giving some away to friends and family; they make great gifts. 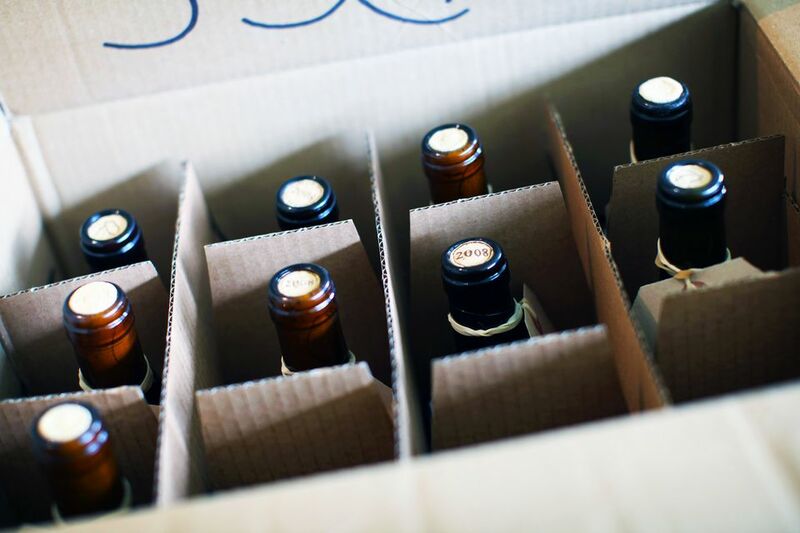 The most secure way to pack wine bottles (and many liquor bottles, provided they are small enough) is to use a specialty wine shipping box. You can find them online and have them shipped to you, or pick some up at a local shipping office. Wine boxes are available in different sizes that will hold either one, six, or 12 bottles. Most include Styrofoam dividers that keep the bottles cradled snugly and prevent them from bumping against one another. These boxes are surprisingly expensive, but they are the best way to ensure your bottles will arrive without breaking. You can also keep the boxes and use them for trips home from the wine shop or to ship wine as a gift. If you're not terribly concerned about breakage, you can save some money and simply use cardboard cell boxes, which have cardboard dividers to separate the bottles. You can get these free at liquor stores (especially large discount stores) or purchase them from shipping offices. In addition to boxes, you'll also need packing tape, packing paper (if you're not using a wine shipping box), and a marker for labeling. The bottom of any moving box is the most important part. Secure it well by reinforcing it with packing tape. Check your box to make sure it will hold the weight. Don't use a box that is too worn or damaged in any way. If the bottom of the box feels flimsy, you line it with a piece of thick, stiff cardboard. If you're using a regular box, rather than a wine shipping box or a cell box, be sure to wrap each bottle before packing it. It's also a good idea to wrap bottles in cell boxes if the cells are too large for the bottles. Place a stack of packing paper on a flat work surface. Check the caps of all opened bottle to make sure they are tight. Place a bottle on its side, perpendicular to the corner of the top sheet of paper. Leave enough room at the corner to be able to start wrapping the bottle. Select two to three sheets of paper and wrap them as one around the bottle, rolling the bottle as you push forward. Wrap the ends of the paper into the roll as you go. For wine bottles, mold the bottle's neck as you roll to ensure it is tightly wrapped. Secure the wrapping with tape, making sure there are no loose ends. Place each bottle into the box, making sure the bottom of the bottle is well protected; if necessary, add some paper to the bottom to provide a cushion. Once the box is full, gently shake it to see if you hear any bottles clanging together. If the bottles are moving around too much, add extra packing paper or use other materials to fill the gaps. Tape the box closed with plenty of packing tape. Finally, label the box with its contents, and mark it with "Fragile." on each side. If you're moving yourself, make sure you place each wine or liquor box on the floor or bed of the moving truck. Do not stack the boxes on top of furniture or other boxes. Also make sure they are not near the truck's loading door or tailgate because items that shift can fall out when you open the door. How Do You Pack and Move Small Appliances?